You know the scene! You are sitting in splendid isolation amongst many others in the train or plane. 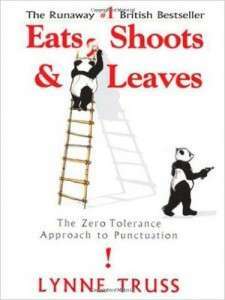 Your neighbor guffaws intermittently, looks sheepishly at you, and says “Sorry, but this is very funny.” It is quite likely she is reading Eats, Shoots and Leaves which is a truly enjoyable, educational read. Author Lynne Truss has a passion for good punctuation which she believes “keeps sense on the rails”. Truss spends some time detailing for instance that the period as presented in the last sentence is an English mannerism where American usage would suggest “keeps sense on the rails.” She conveys her message and lessons about the problems associated with poor punctuation via a glib English wit and some very humorous illustrations, (“What is this thing called, love?”) and a very funny joke related to the book title. But this is not just a humorous book. It is truly educational. As one who writes a lot, I do admit to some confusion at times as to which punctuation should be placed where. Aisle admit (OK, I’ll admit) I still get it wrong, but when there are 17 different rules related to the comma, this might be understandable! The problem I now have is I spend too much time wondering what the correct punctuation should be! Should I have put that exclamation mark at end of last sentence for instance? Any book that can provide education and entertainment at the same time is worth reading. This book provides education and entertainment at the same time. It IS worth reading. PHONE Conor Cunneen at 630 718 1643 for your next engagement.